The Good Shepherd of ALL God's People! When I was just a neophyte in ministry I met an interesting character at a community organization meeting. We were in the midst of dealing with the integration crisis in Boston, and the community was in need of much healing. He was a member of the local Greek Orthodox Church, a short squat fellow with almost a week’s growth of unshaven face on him. His clothes looked like they slept with him, and from the corner of his mouth he continually chomped on the stub of a cigar. I guessed him to be in his sixties, but that was difficult to tell, given the way in which he carried himself. Come to find out, he had been a shepherd in Greece before he came to this country. 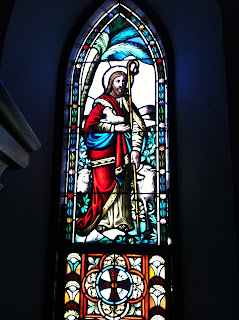 I had never met a shepherd before (I haven’t met once since either for that matter) so it was only natural for me to ask him what it took to be a “Good Shepherd”. “Tree tings,” he said without hesitation and with a heavy accent. I was fascinated by this facile explanation, but it made abundant sense to me. You must know the sheep personally, you must be willing to discipline them; after all, the word discipline at its root means to make sure they follow; and thirdly, you cannot keep the flock together without a good sheepdog or a border collie. Parenthetically, it is interesting to note that the shepherd follows the sheep. The sheep have a pretty good sense of where they are going. The shepherd follows so that he can keep an eye out for a stray or a group that might stray or worse still if a flock splits. Only with good sheepdogs or border collies can you keep the whole flock together or to drive them back to the sheepfold at the end of the day. The wolf may in fact harry the flock but the Good Shepherd will put himself in harm’s way to protect the sheep and he will drive away all danger and keep the sheep safe. 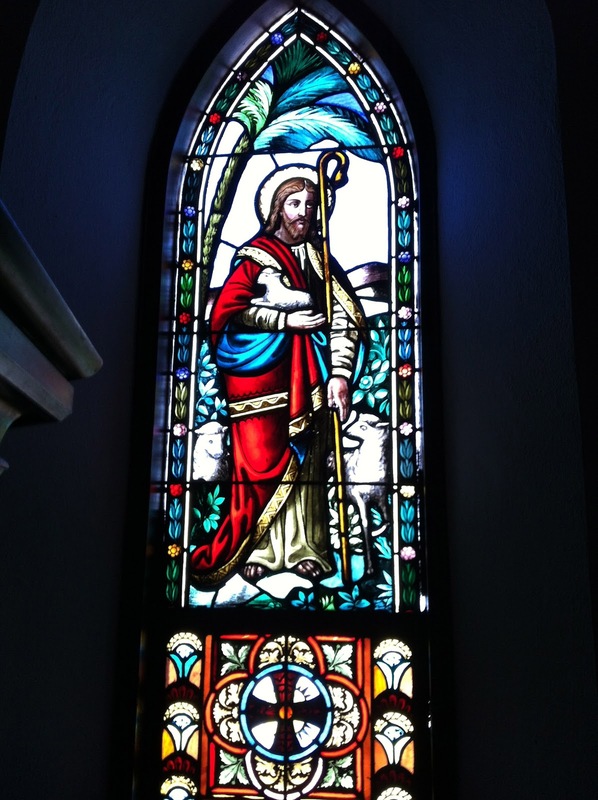 When I think of the Good Shepherd, I cannot help but think of the Salvation Plan of God. There is an orphanage in the South Sudan, which the Diocese of Bethlehem was instrumental in building and supporting. This is part of God’s salvation Plan. There is a wonderful church in Douglassville PA with lots of young people and a day care center called the Good Shepherd Learning Center. More than a hundred of our community’s children are gathered day in and day out. They learn together. They have fun together. They are kept safe together. This is part of God’s Salvation Plan. Across the parking lot from the Church there is the Keystone Villa, a place for seniors to spend their latter years of life together and safely. We care for them too and know that well we should, since many of us will be gathered into places like that at some point in our lives. We all know intuitively that there is a Salvation Plan and that it is built on the idea that we all know instinctively the difference between right and wrong. And for those who may not quite get it, we have it a Law written in stone to help us figure out the basics. Interestingly, we all know where we are headed as the flock of Jesus Christ. We know where we’re going because we abide with the Shepherd all along the way. The Shepherd likewise abides with us. We hear his voice though he is often removed from our sight. He calls us each by name. He keeps us together because when we stray away from the flock someone comes to seek us out, circles around once or twice and we resume our safe pasturage until the day’s end and we return by the sheepfold to find that we are home again. Whether we find ourselves in an orphanage in Kago Kegi, a place called the Good Shepherd Learning Center, or the Keystone Villa, we have a place where we can call home; it is called St. Gabriel’s Church, Douglassville, PA. For my life’s journey there have been other names like St. James’s, North Cambridge,MA; St. Richard’s, Toronto, Ontario; St. Luke’s, Malden, MA; Christ Church, Hyde Park, MA; The Church of the Epiphany, Euclid, OH; Holy Cross & St. Cyprian’s, Pawleys Island, SC; St. Andrew’s, MA; St. Mark’s, Saint Albans, WV; and St. Peter’s, Salem; MA. Don’t you see how different life is now? Now that you have become a part of God’s Salvation Plan, now that you have been adopted by God as one of his children, do you not see the difference? Or do we take it too much for granted sometimes? Now we can bask in God’s boundless love for us, do we not see how different life is now! His forgiveness is such that he would even give his son for us as payment for our sins. Now our sins are not counted against us. Instead we are now transformed from Glory to Glory through his abundant Grace. So now sin and disobedience are not our calling, but Grace and Joy are the condition we are called into. We have found a home in him because he is our Good Shepherd. And there are still more sheep that must be drawn into to his house and his great mansion. In ever widening circles of inclusion we see the savior’s embrace reaching out from the hard wood of the Cross so that everyone may come within the reach of His embrace. It is interesting how so simple a Proclamation can be so controversial as we no doubt notice in the Episcopal Church. But we know God Shows No Partiality! If we believe that Jesus really is the Good Shepherd, then we will live out the implications of that in our Gospel life. I hope that as impractical as that may sometimes seem, we will at least make the attempt to live the Gospel life. There is a striking similarity between these two images and both strike a responsive chord to the biblical charge of idolatry. 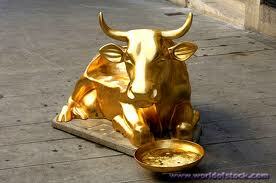 The Golden Calf signaled the rebellion of the Children of Israel against the Law of God. 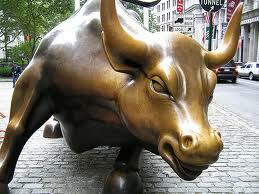 The Wall Street Bull signals the rebellion of the Children of America against the Law of Greed and Self Will gone wild. Frontline has done a good job detailing the particulars in its current series on Money, Power and Wall Street. Not only do we stand judged by our own Greed, but we also stand near the precipice of insisting on our own self destruction. We fight sensible self regulation. To ask that the rich and the super rich pay as much taxes as their menial helpers is fought with every fibre of the political might of the right wing. They claim that it would be a job killer to tax business at a rate that is equal to those who have work for these same businesses or even those who have been laid of from them. It is untrue to say that fairer taxation is a job killer. Business has more cash on hand than at any time in the past 20 years, and still no jobs! Not something I might add that God is doing to us; it is rather something we are doing to ourselves. The people arise in protest. 99% Rise up in protest. Something is telling us that the rich and the super-rich and the multi-national have gone way too far toward the Wildness of Unrestrained Greed! Common sense tells us that lie upon lie continues to sap the middle class, the working class, and the poor. The Occupy Movement has not gone away. In fact a whole new burst of energy is close at hand. Let us pray that we are not too late. Even Trinity Church in Wall Street is preparing a May Day Teach In! When the Episcopalians on Wall Street figure out that that things are way out of hand you know that we are onto something. Keep pushing folks. We're onto something! God knows there’s plenty to complain about. Even the weather has turned foul. We’ve witnessed a terrific spate of tornadoes over the past few weeks, and many have been left homeless and too many dead and injured. Please remember the Episcopal Relief and Development Fund to help those in need. The tenor of our political discourse has little to commend itself. The anemic economic recovery is a bit discouraging. What concerns me most is that our young people are facing a very uncertain future concerning jobs, and I can’t honestly say that either political party has its act together in terms of offering real hope. Politicians offer promise but not much in the way of performance. This won’t do! “You mortals how long will you dishonor my glory and how long will you worship dumb idols and run after false gods!” (Psalm 4:2) God’s getting a bit riled up over this. Idolatry begins with my willfulness. Notice the Lord’s Prayer takes at its heart the notion “Thy will be done”. And Jesus in the Garden says to God; “Not my will, but Thy will be done”. Idolatry is the self seeking willfulness without regard to the others. This is why we must gather together week by week. I taught my Communion Class this morning that we begin in church with gathering. Without gathering we can have no church. And if we stop going because we cannot have our way, we diminish the Body of Christ, and our hearts sink. Is it any surprise that as church attendance declines, depression becomes more rampant? It is tough enough to keep up our spirits with each of us cheering one another on, but when we sink into loneliness and become solitary we take on a whole new battle. What cheers me up is the moment when I enter the Holy Place. When you enter a Mosque, you must remove your shoes. When you enter a Synagogue, you must wear a yarmulke, and when you enter a church you must remove your hat, unless you’re a lady. You may wear yours. I remember when I was younger that all these rules were strictly adhered to. And that it was necessary to dress formally with your Sunday best and present yourself to God at your finest. We’re a bit more flexible these days. God cheers us with the knowledge that Jesus is here in our midst. He appears to us in this Sacrament. We take bread to eat, we take wine to drink. Jesus asks for a piece of fish to demonstrate he is real. Jesus is no ghost. And in those rare moments when the appearance of Jesus becomes urgent, necessary, or surprising, our experience of God takes on a very special significance. Crisis of any sort brings us in contact with our humanity and our vulnerability, and we get scared, or even terrified as the disciples were in today’s Gospel lesson, we may also come into the presence of God. “Oh God!” is often the only prayer we can say in a moment of crisis. If we’re really scared we might say something else. That’s why when I gather with you I practice the Presence of God Sunday by Sunday (or Saturday by Saturday), and I carry on that practice every day, every moment, so far as it is possible, so that when we gather again we do in fact “Lift up our hearts to God”. I make this my practice because I know all too well that when those moments of terror strike, I need a Rock to hold onto. I’ve seen it in recently in my own son’s struggle for recovery after a stroke. I’ve seen it a thousand times as a parish priest as folks deal with one crisis after another. That’s when I see Jesus. That's when the eyes of our faith open. In recovery one day with my son, while were doing some physical therapy and stretching his arms and hands and fingers, the old hymn came to me; “Awake my soul, stretch every nerve”. I sang a verse with him and we began to laugh! We’re both Anglophiles and it did sound so much like a moment in an episode of the Vicar of Dibley. We laughed all the more. In case the politicians forget what the scripture says; you remind them. Remember, like Jesus, you too have been anointed to bring Good News. By living this way, you have a good shot at living as Jesus wants you to live, abundantly, joyously, courageously. Oh yes, cheer up my friends or as the faithful folks have been saying for two thousand years; “Lift up your hearts”. Somebody needs to tell the Holy Father not to bully nuns. According to a recent New York Times article and according to the Vatican itself, it has become necessary to reign in a national network of nuns for their outspoken commitment to the poor, the uninsured, and the unemployed. This is some kind of sin? It is no wonder that so many of us are seeking God in another venue. We feel driven away from the institutional church in so many ways. The Holy Father also invited disaffected Episcopalians to come over to Rome if they disagree with the notion that God's love extends to women and gay folk! What??? Yes, Episcopalians have opened ministry and membership to all without regard to gender or orientation. But to any reasonable person, doesn't it make sense that if we are to extend God's Grace to all races, ethnicities, classes; that it also follows that this Grace also extends itself to women as well as men, to gay folks as well as straight? Somebody needs to remind the Holy Father that the fellow whose chair he occupies made it clear in one of his earliest sermons that "God show no partiality". The Easter reading we proclaimed in church just a few weeks ago said as much. Peter went on to say that "In every nation, anyone who does what is right is acceptable to God". Your Holiness, please notice that Blessed Peter said "Anyone". There were no exceptions built into that statement according to orientation or to gender. And yet you will provide refuge to Episcopalians who cannot abide the idea that a priest or a bishop might be gay or straight, male or female. Peter did not make exceptions for any of the convenient pigeonholes we like to place people into. We are all one flesh, we are all one blood. So now these wonderful faithful people who love their church and who love their Lord and who heed the Gospel on behalf of those who are poor and bereft of hope, these people you now seek to reprimand and reign in. Frankly, I thought it a bit of a cheap shot at us when you invited disaffected Episcopalians to become Roman. There has been a trickle. But I might make bold to say that such a pastoral and theological can backfire. There may be a disaffected Roman Catholic or two who is shocked and dismayed over the whole child abuse scandal and how the church handled it. Some Roman Catholics may be divorced and find themselves excommunicated. Where are they to find refuge? Some have gay children; where are they to look for unconditional love. Many of your priests seek to love someone in a wholesome and faithful kind of way. Where can they look for a kindly welcome? And then there are your faithful nuns who seek to tend to the poor without bulling for a harsh hierarchy. Imagine, they supported health care for uninsured Americans! There is a new and emerging church out there based on the notion that God is Love! It is not a church organized around the notion of denomination. 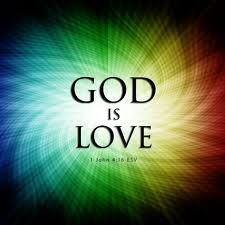 It is organized around the notion that God is Love, and that Love is Unconditional. God shows no partiality; when will we? 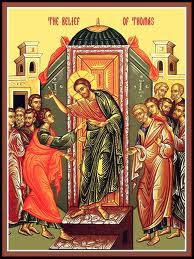 Our readings today proclaim the story of our dear friend "Doubting Thomas". Not only do I like Thomas, I think that without him there can be no real faith, and I would go a step further. Without Thomas, scientific inquiry could never have found a home in the world of faith either. Many can take their faith blindly on the basis of other witnesses. And there certainly is a special blessing for those able to do so. Not so Thomas. He wanted to see it with his own eyes, touch it with his own hands. He is the Patron Saint of the fellow from Missouri; the “show me state”. Down through history, some of the greatest minds in science have also been great minds in the world of faith. Copernicus for instance set the stage for Galileo’s struggle to make us aware that the earth was not the center of the solar system, but that the sun was. He was a papal nuncio and brilliant canon lawyer, but he was also a mathematician and an astronomer. And his curiosity; his inquiring and discerning mind could not let go of the elegantly simple thought that the earth and planets revolved around the sun. He worked out many of the mathematical problems and it became clearer and clearer to him that he was onto something. He was fortunate that the publications of his new theory came near the end of his life. He was reputedly given a copy of his newly published book describing the orbits of the celestial bodies on his death bed, and thus, it is said, he died in peace. True enough, both Copernicus and Galileo were persecuted by the Biblical literalists but that did not change the fact that they were correct. And after 600 years of so the church did apologize. As humbling as it is to wake up one morning and figure out that the universe does not revolve around you, it is just as essential. For until we discover our true place in God’s universe, we cannot have a true understanding either of ourselves or of God. This is the nature of the scientific enterprise. It is essential for us in discovering the truth. Another good example of just such a man is Gregor Johann Mendel, the Augustinian friar who pioneered the work of modern genetic research. He really didn’t know that’s what he was doing. He was just trying to grow better varieties of peas for the monastery. Then he began to notice that traits in pea plants followed particular patterns. He took careful and complete records. His work was not recognized until the turn of the 20th century, but finally his curiosity and his search for fact and truth was finally rewarded. Then there was our own Charles Darwin. He was a devout member of the Church of England and studied theology, and even took the bible quite literally as an ethical guide for human behavior but not as a document for scientific authority. He noticed aboard the Beagle in his five year journey around the world that fossil remains, and the amazing variety of species that he witnessed in places like Patagonia, for instance, began to suggest to him the notion of natural selection. His discoveries have revolutionized the way we think of the evolution of our own ancestry in the development of humankind. It may be humbling to recognize that we are inextricably interwoven with all life, but that’s the truth of the matter. So controversial is his work that there are places in the United States that take his work as a threat to biblical authority. In some states Evolution must be presented as a theory on a same level as Creationism as if they were completing and valid scientific options; the one based on flawed human inquiry and the other based on inerrant biblical revelation. That’s like saying; “Nah, the sun still revolves around the world”...don’t believe facts and figures and scientific observation, and for God’s sake don’t look into that telescope!" Such thinking is an assault not only on the truth of science but on the truth of faith as well. The ongoing battle between science and religion is a false one for most intelligent and educated people of faith and/or science. Some of the greatest minds of our time have seen a role for both. One of my favorite quotes is from Albert Einstein who is often thought to be an atheist. But hold the phone; was it not he who said this; “Science without faith is lame; and religion without science is blind!” Thus for many thoughtful folks science and faith can be mutually creative and corrective. In our own church, Margaret Mead taught us a great deal about cultural relativism in her observations in in the South Pacific. Her book; “Coming of Age in Samoa”, is mandatory reading in most Liberal Arts Colleges. As a brilliant thinker she was clearly a formational mind in the development of cultural anthropology. She was also a devout Anglo-Catholic and an Episcopalian. And lest we forget our current Presiding Bishop. Not only is she a marvelous and articulate woman of faith; she is also a brilliant biologist and a pilot. She is indeed a Renaissance woman. So then that brings me back to Thomas. He would not believe until he saw it with his own eyes and touched it with his own hands. I am like that in many ways. And yet when I look and when I touch what is indeed around me, I see and feel a world that reveals that God is very much alive, and that Jesus is alive in the hearts and lives of those around me. The Resurrection of Jesus is not so much a reassuring comfort to us about where we go when we die, but an ethical demand about who we are called to be while we are alive. There are the poor to be fed, the homeless to be housed, the young to be educated, the elderly to be cared for, the sick, the bereaved and the broken heated to be mended with the healing touch of Jesus. That’s something I can see and touch. It is the healing touch of Jesus that will make all the difference. I can assure you that God’s existence does not depend on whether you can wrap my mind around various doctrinal statements. When I am asked to "Believe" in the Creed, I am not asked to give my intellectual assent to a credal formula, as much as I am asked to make a commitment to a way of life. In many ways, Christ’s existence does depend on whether I am willing to do the work of the living and loving Christ for the sake of the world. God Shows No Partiality! When will we? Happy Easter to you all. I do hope that your day and in fact this whole season is full of all the joy of Easter! We are blessed indeed to be with each other and to greet this day with a church as beautiful as it is, with folk gathered and filling this sacred space with radiant faces and dressed to the nines with Easter finery! We’re lucky to be here you know. There are those who would prevent us from being here on this glad festival day. There are those who will claim this day only for a certain “chosen” few. We read in the Acts of the Apostles (15:1) that this Gospel is only for those who are adherents to the strict Mosaic Law, or the Levitical and Deuteronomic Code. There are those who will tell you that there are true and false churches and that there are those who are “in” and that there are those who are “out” and these folks seem to know who’s who in God’s kingdom. The Early Church struggled with this question at its very first church council in Jerusalem. And it took a while to work out the particulars of the first great controversy but then it finally fell to Peter and Paul to get it right and proclaim the Gospel as we have now received it. Peter and Paul came to understand the Universal or “Catholic” dimension of this Gospel. There is that word “Catholic”. Its primitive meaning has the dimension of universality build into it. So Jesus is understood to be the one who recognizes humanity’s radical oneness. He came to break the dividing walls that separate people one from another. As Peter puts it in today’s Lesson from Acts; “I truly understand that God shows no partiality, but that in every nation and among all peoples, anyone who fears God and does what is right is acceptable to him”. There, that settles that. I hope you notice that Peter said “anyone”. He did not denote identity by way of Nationality, Ethnicity, Class, Gender, or even orientation. He said “anyone”. He did not say “Liberal” or “Conservative”; “Democrat” or “Republican”, he said “anyone”. By the way, as the political season heats up I will say this and only this. As the Holy Spirit’s Dove cannot enter the human spirit without both wings, neither can the American Eagle soar unless it does so with both of its wings; Left Wing as well as Right wing. So much of the rhetoric we hear as the race for Congressional seats and the White House heats up will include disparagement about one sector or another of the Body Politic of this nation. It is the disparagement with which I take issue. We are One Nation. 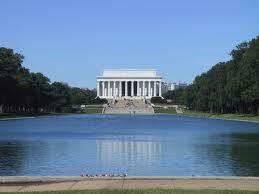 “Under God was added in the mid 1950’s. But we are One Nation. This is the central fact of our citizenship. We may take issue with one another on issues. We may not take issue with one another in our personhood! And we are one people, Catholic and Universal. We are one flesh. We are one blood. There is an old Arabic saying I heard when I was on Pilgrimage in the Holy Land among Christian Palestinians in the West Bank. If ever there were a place for people to be divided and enslaved by sin, it is there at the very site of the Birth, Life, Death and Resurrection of Our Savior. It is no wonder when you think of it that Jesus would select such a place in which to exercise his ministry. One wonders if it is the color of an Arab, a Jew, a Gentile, a Black man or a White man, an Oriental or any other indigenous tribal/racial grouping, or whether the color of God can be divided between gender or even orientation. Can God be divided by Class into rich and poor, slave or free? How can we divide God? How therefore, can we divide humanity? The answer given by an old Arabic woman is this; “The Color of God is the Color of Water”. She smiled and sat back in her chair after she made her pronouncement. She knew that we were intelligent enough to know that water is colorless and odorless. She also knew that the thought would rattle around in our heads and soak up into our spirits as we came to realize that the majority of the human body is made up of water. As she was a Christian, she also knew that we might even remember that we are baptized into the Body of Christ through the waters of Baptism. She kept on smiling. And we talked on as we returned to our bus to travel from one sacred place to another. This is what the women did not and could not understand when they went to the tomb that first Easter morning early in the day. The fact is they thought someone had stolen the body. And that’s what they told the disciples. Don’t be surprised if you don’t understand everything that there is to be understood about the Christian Faith. The folks who were there front and center didn’t get it right away. They cam to understand it. So will you. 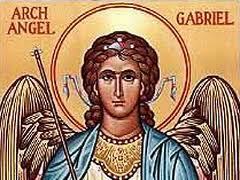 For the time being I’ll be like Gabriel if its all the same to you. I’ll blow the horn if you don’t mind and proclaim the Resurrection of Jesus with all my heart and soul and mind. I don’t need to understand every bit and piece of it all, but I do know this. “The Right Hand of the Lord has triumphed! The Right Hand of the Lord i has triumphed! My church has said in no uncertain terms. This church is a house of prayer for all people. Not only did he burst forth from death’s prison for the forgiveness of our sins, he burst forth too from the dividing wall that separates human beings one from another. The color of God is indeed the color of water. He died for all. He forgave the sins of all. 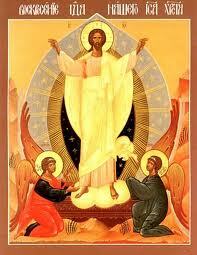 He is Risen for all. I wrote this statement last Spring as I looked down the long barrel of class warfare being waged against us. I'm in this for the long haul. We need to be clear about where we stand. What I list below is a reasonable set of demands. What is not reasonable is that we should carry the rich on our backs enduring heavy unemployment, working for $5 an hour, with no health insurance, no vacation, and then having them take our homes away and giving our jobs away and taking our jobs away. We may or may not do it this time, but momentum is building. Eventually we, poor, working class, middle class, first responders, teachers, etc. will all see that we are all on the same side. The people shall arise from slumber! From Cairo to Wisconsin the people have taken to the streets to demand justice. The grinding poverty under which too many of us are living has caused enough pain! We labor for wages that cannot support a family, while the super-rich are giving themselves billions in tax cuts and immoral bonuses. The corporate machine lays us off, and ships our jobs overseas. Now they are taking aim at government jobs and collective bargaining. They want to take away a hard won health care victory, they want to take away our homes, they want to take away our social security, and cut medicare and medicaid all for the sake of lower taxes for the rich. They have no idea of the pain they inflict upon the poor and the worker and now even on the middle class. It is time for us to gather at every town and city hall across the country and I dream of a day when by the millions we gather at the Lincoln Memorial and stand our ground until our just demands are met. We demand that all teachers, police, fire and EMT’s be rehired and that we beef up education and public safety. It is a matter of national security! We cannot afford not to do this at the very least. Paul Bresnahan is a semi-retired Episcopal Priest on assignment in Douglassville, PA at St. Gabriel’s Episcopal Church.